Those who are diabetic need to pay particular attention to their vein health. 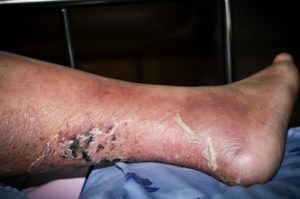 While venous insufficiency is only one of three causes (the other two being peripheral neuropathy and peripheral arterial occlusive disease) it is a leading reason ulcers begin to form in patients who have diabetes. It’s a fact that nearly one-third of diabetic patients with chronic venous insufficiency will also develop, before the age of 40, venous ulcerations. This type of ulcer is a direct result of the loss of circulation and sensation. It is followed as a close second for cause by peripheral neuropathy. For any illness or malady, the best treatment is to go right to the underlying cause. Treating venous insufficiency as it develops can help patients maintain circulation and avoid ulcerations which can be very difficult to heal. Wearing compression socks or stockings daily to help alleviate pressure is recommended. It is also commonly prescribed to take frequent breaks with your feet elevated above your heart. While vein issues, especially ulcers can be painful, keeping your body in motion is still important. The motion of walking keeps the blood pumping and the movement of the blood keeps the veins healthy. While it may seem like sitting and resting all of the time would be best, the opposite actually holds true. Symptoms of a venous based leg ulcer can include itching, pain, and swelling (edema) in the affected leg. Dark purple, brown, or red hardened skin is a sign that blood is pooling. You may also experience a tingling sensation caused by blood trying to get back into sections that it has flowed away from. Once an ulcer appears it may be red or even yellowish, have unevenly shaped edges, surrounding skin may feel hot and be tight. If the sore progresses it may become infected. When infection begins it may start to give off an unpleasant odor. Advanced ulcers may also include puss which drains or weeps from the wound. It is important to seek medical treatment. Left alone to advance without care the possibility of the need for amputation becomes a reality that no one should ever have to face. If you are in the Tampa Bay / Safety Harbor, Florida area and are showing symptoms of venous issues or ulcerations please make an appointment to come in and see us at the West Florida Vein Center today. You can schedule by calling (727) 712-3233 and making an appointment with Dr. Zuzga. You may also visit our site to learn more by going to www.westfloridaveincenter.com.